Come Jan 1st, those innocent “climate quips” could just land you in a cold cell. The video comedy sketch above is actually hitting very close to home. Our latest and somewhat controversial article on global warming has prompted some readers and Facebook members to say that “They (21st Century Wire) should not be allowed to write (our critical essays and news challenging the UN’s global warming orthodoxy)”, and that “They should confine themselves to blogs or talking loudly at bars, where they can safely be ignored”. In other words, the UN’s science summary is holy law, to challenge or question it is akin to heresy. MISSING: Has anyone seen this man lately? 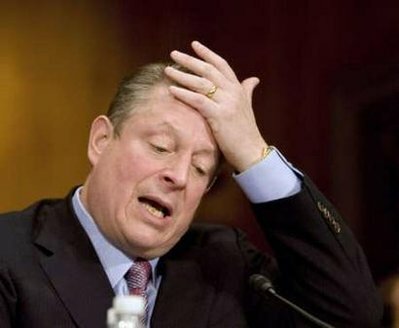 It’s worth pointing out here that the global warming church will always cry in chorus “climate change!” anytime there is a heat spell, a hurricane, an earthquake or a sandstorm, but will condemn and excommunicate heretic ‘deniers’ like us who are simply putting across a collection factual research and nonpolitical opinion that challenges the UN’s controlled party line. If there is an iron maiden in the basement of the UN building in New York, surely our writers here at 21st Century will have advanced booking privileges. Actor Danny Glover made such a statement after the Haiti Earthquake disaster- blaming the disaster on climate change, which means that 21st Century Wire would be well within its bounds to decree that he should not be allowed to act as a result. Would we? Of course not, we like Lethal Weapons 1 & 2… a lot, but Danny will end up paying the price in ‘street cred’ (he’s been docked a few) if he goes and says anything outrageously absurd on global TV. FYI note for the Climate Taliban, please can you make my hair shirt a medium, thanks, and with a 16.5″ neck. It’s almost comical, yet it’s enough to make you nearly cry. Readers you still have the choice: keep taking your blue pills, or wake up and deprogram.